European and national policies on Vocational Education and Training (VET) need to be informed by sound and internationally comparable statistical evidence. The VET country statistical overviews are concise, descriptive and user friendly statistical reports. 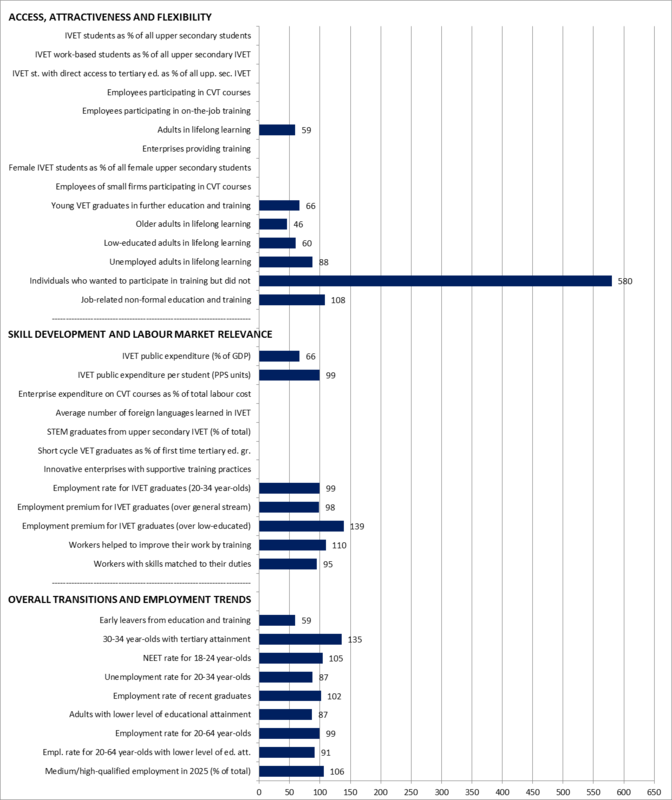 For each country, they quantify and compare key aspects of VET and lifelong learning. The selection is based on the indicators' policy relevance and their importance in achieving the Europe 2020 objectives. NB: The index numbers are derived from data summarised in the table. Data in the table have been rounded to one or two decimal places. The calculation of index numbers is instead based on not rounded data. Ireland’s performance on a range of indicators selected to monitor progress in VET and lifelong learning across the European Union (EU) is summarised below. The chart compares the situation in Ireland with that of the EU, based on the most recent data available (this differs by indicator). Data in the chart are presented as an index where the EU average equals 100. If the index for a selected indicator for Ireland is 100, then its performance equals the EU average. If the index is 90, its performance is 90% of (or 10% below) the EU average. If the index is 200, Ireland’s performance is twice (or 200%) the EU average. For some indicators, such as early leavers from education and training, a country is performing better if its score is below that of the EU average. Data on which the index is calculated are presented in the table, which also shows developments over time. A technical definition of each indicator is provided in the annex. Participation in IVET at upper secondary level of education (ISCED 3) is currently negligible or not even applicable in Ireland. This is based on international definitions and available information (2015) and represents a peculiar situation. However, there are VET graduates in the young population reflecting the output of the VET systems in previous years and at ISCED 4. The percentage of adults participating in lifelong learning in 2016 in Ireland (6.4%) is lower than the EU average (10.8%) and below the average target (15%) set by the strategic framework Education and training 2020. Participation rates in lifelong learning for older adults, adults with low-level qualifications, and unemployed adults are also lower than in the EU. In 2014, public expenditure on IVET (ISCED 3-4) as % of GDP was markedly lower in Ireland (0.36%) than in the EU generally (0.54%). The employment rate for IVET graduates (aged 20 to 34) at ISCED 3-4 (77.3%) is sligthly lower than the EU average (78.1%). Their employment rate is 5.6 percentage points higher than for graduates from general education (a positive employment premium close the EU average of 5.7); the employment rate for IVET graduates is also 32.5 percentage points higher than for graduates with lower-level qualifications (above the EU average of 23.4). All employment figures relate to 2016 and exclude young people in further education and training. In this section all data refer to 2016 unless otherwise stated. Between 2010 and 2016, the NEET rate for 18 to 24 year-olds and the unemployment rate for 20 to 34 year-olds have decreased by 8.2 and 7.2 percentage points, respectively. The NEET rate (at 15.9%) is slightly above the EU average (15.2%), while the unemployment rate for 20 to 34 year-olds (10.3%) is below the EU average (11.8%). The employment rate for 20 to 64 year-olds is 70.3% in Ireland and 71.0% across the EU. The share of recent graduates in employment has increased by 8.5 percentage points between 2010 and 2016 to 79.5%. This level is above the EU average (78.2%) but still below the EU target of 82%. Educational attainment of young people compares relatively well in the EU context. The share of 30 to 34 year-olds with tertiary-level education is higher than the EU average (52.9% versus 39.1%); the share of early leavers from education and training is lower than the EU average (6.3% versus 10.7%) and below both the EU target (10%) and the country target (8%). EU refers to EU-28, unless otherwise specified. Arrows ↗ or ↘ signal a positive or negative change. Arrow → indicates: no change. (A) UOE back reconstruction of 2010 values based on ISCED 2011 not yet available. (B) AES 2011, used as proxy for 2010 baseline. (C) 2014 b flags in Eurostat online tables ignored on the basis of other relevant Eurostat metadata. (D) Forecast made in 2016. (E1) Based on 28 countries, with partial information for NL. (E2) Based on 28 countries, with partial information for EL, ES, NL, PL, RO. (E3) Based on 28 countries, with partial information for IT, NL. (E4) Based on 23 countries (missing: DK, EL, HR, IT, PT), with partial information for IE and FR. (E5) Based on 23 countries (missing: DK, EL, HR, IT, PT), with partial information for IE and FR. (E6) Based on 28 countries, with partial information for DK, EL, NL. 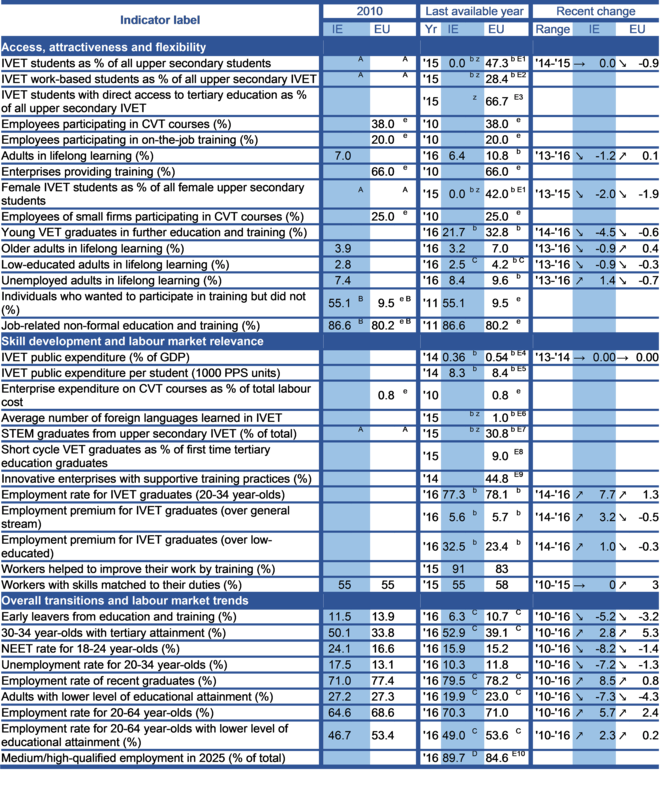 (E7) Based on 25 countries (missing: HR, IT, UK), with partial information for BE, CZ, DK, DE, EE, EL, LU, NL, PL, SE. (E8) Based on 25 countries (missing: IE, FR, UK), with partial information for BE, EL, LU. (E9) Based on 26 countries (missing: IE, UK), with partial information for DK, DE. (E10) Based on 28 countries. (b) Break after 2010, therefore baseline data not included. (u) Eurostat: ‘low reliability’. (z) Eurostat: ‘not applicable’. (e) Eurostat: ‘estimated’.